External hard drives are the best way to give your computer some breathing space, as your old hard disk fills up. They are easy to install, just plug and play, and are well, portable. The Transcend 500GB hard drive is a small form factor (2.5”) portable drive which requires no external power source, and is thus truly portable. It is quite small in size at around (134mm × 80.8mm × 18.8mm), small enough to fit into your pocket, and weighs merely around 200g. It has in its innards a SATA drive, and thus offers good speeds over a USB2 connection. You can use it on Windows 2000 and later, MacOS 9 and Linux kernel 2.4 and over without needing any additional drivers. An interesting feature it provides is its”OneTouch” AutoBackup button, which is unusual for a product of this range. 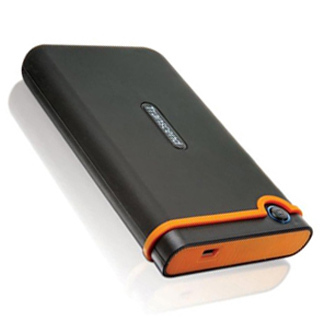 The portable hard disk comes with the Transcends own StoreJet Elite software solution. It provides backup features such as scheduled backups and one touch backups using the AutoBackup button, security features such as setting a password to access your hard disk, and compression. The hard drive comes is enclosed in a rubber casing to protect it from shock, and boasts a compliance with U.S. military drop-test standards MIL-STD-810F. Overall it provides a pretty complete picture as expected from a Portable Hard Drive today, and its large 500GB capacity is sure to come in handy on the go.